The Lubavitch House has been a center for Jewish life at the University since 1980. However, recent picketing efforts by Philadelphia union workers have disrupted the House’s $2.8 million expansion project. For the past two weeks, picketers from the International Brotherhood of Electrical Workers, Local Union 98, have protested the use of non-union workers on the project, disrupting house activities, as well as residential life. “Everyday they wake me up at 8 a.m. … including Saturdays,” said Pine Street resident and 2008 College graduate Eric Leventhal. “They’re disturbing the peace of the entire neighborhood … it’s incredibly inconsiderate on their part,” he added. Union picketers have been using megaphones to chant and criticize Lubavitch House Director Ephraim Levin for choosing E. Allen Reeves, Inc., as the general contractors for the project. “E. Allen Reeves consistently uses subcontractors who do not receive medical benefits for their wives and families [and who have] unfair wages and no retirement plan,” said Robert Bark, business agent for the union. The general contractors were chosen from an open and public bidding process, and the Lubavitch House’s goal was to simply “take the best bid we could get,” said Levin. The expansion project is not funded by the University and depends entirely upon support from alumni and private donations. Levin emphasized that finances were the foremost concern in the contractor selection process. “We have an obligation to our donors to do the project in the most economical way possible,” he said. The picketing has not yet interfered with any actual construction, and the project is still expected to be completed in December 2008. Due to complaints that noise was interrupting religious services, Bark and his volunteers have stopped using the bullhorns – but only for now. “Our fight is with E. Allen Reeves, but our fight [will also] be with the electrical contractor when he comes on the job,” said Bark. This means that the bullhorn will return, and not only will it broadcast the union’s protests at 8 a.m. – “the best time to get attention,” said Bark – the protesting will move to Spruce Street and overlap with the start of classes in September. While Bark does “100 percent feel bad” about disrupting the neighbors, he nonetheless said he hopes his union’s efforts inspire the public to “join in the fight” for fair wages and benefits for workers, he said. But for residents like Leventhal, keeping the peace is a higher priority. “Regardless of whether [the picketers] are right or wrong, there’s no need to terrorize the neighborhood,” he said. While construction takes place at 4032 and 4034 Spruce St. – the permanent location of the Lubavitch House and future Perelman Center for Jewish Life – Lubavitch House activities are functioning out of a temporary location on Pine Street. The former operator of the Empire State Building‘s Skyride was charged Thursday with pretending to be a doctor so he could give unsuspecting women “gynecological exams,” police and prosecutors said. Wealthy businessman Zalman Silber, 40, was arrested at his Monsey, N.Y., home Thursday morning and accused of molesting two women, ages 18 and 20, in his twisted charade, sources said. He hired as his defense lawyer disgraced former Rockland County prosecutor Kenneth Gribetz, who stepped down after his proclivities for wearing women’s clothing and a dog collar were exposed by the Daily News more than a decade ago. “It doesn’t often get stranger than this,” a police source said. Silber, a Hasidic Jew and father of five, was charged with third-degree sexual abuse and unauthorized practice and professions for impersonating a doctor, law enforcement sources said. Silber’s pregnant wife, Gila, declined to comment at their home Thursday night. Silber moved to the Rockland County community from Borough Park, Brooklyn, a year ago, neighbors said. Silber fooled his victims by saying the exams were part of a medical survey, prosecutors said. Legitimate doctors who had offices in the same Manhattan building where Silber allegedly molested the women were stunned to find the polite man was accused as an imposter, sources said. Investigators in the NYPD‘s Manhattan special victims unit believe Silber’s “exams” may have started in 2003 and were checking into the possibility that there are more victims, law enforcement sources said. “He asserts his innocence. We feel this is a total mistake,” Gribetz said. In the 1990s, Silber was considered something of a business whiz. He was hailed by Inc. magazine in 1998 for creating a $9 million business offering tourists a simulated helicopter tour of the Big Apple through the New York Skyride at the Empire State Building. “Take advantage of other people’s toil. That’s really what everything is about,” Silber told Inc.
Silber gave up his post as the company’s president that same year and promised not to compete in the virtual entertainment industry for 10 years, according to financial documents. It was unclear why. The suspect was arraigned in Manhattan Criminal Court early Friday morning and released on $10,000 bail. Gribetz told the judge his client earned more than $1 million a year. Assistant District Attorney Amy Hare said Silber used an unnamed intermediary to bring the victims to him. “Those women assumed they were going to see a real doctor,” she said. In Borough Park, Alexander Halpert, 29, whose sister was formerly married to Silber, defended him. “He’s a good man. When someone needed a doctor, he would arrange it,” he said. The publication of Postville: A Clash of Cultures in Heartland America in 2000 by Professor Stephen Bloom of the University of Iowa put the town of Postville (population: 1,478) on the national radar. Eight years later, it’s again garnered national attention with the federal raid on May 12th on the Lubavitch-run AgriProcessors kosher slaughterhouse in Postville. The presence of illegal and under-age workers were the precipitating factors for the government’s intervention– 389 Mexican workers were arrested, 200 were sentenced and the rest were to be deported. In the intervening days, there’s been a weird split in response within the Jewish community. Whereas some have been calling for a boycott of meat processed from this company’s plants—Rubashkin, Aaron’s Best, and David’s brands — as promoted by the year-old Orthodox social justice group, Uri L’Tzedek, Hebrew for “To Awaken to Justice,” others have refused to take notice. As reported in the New York Jewish Week [5/30/08], the owner of Glatt Mart in Flatbush, Brooklyn– which sells some 75,000 pounds of meat monthly– claims that not one customer has asked which meat is Rubashkin’s! Up the service road to the Getty Villa, at the base of Gene Gladden’s property and next to the Mormon Church’s brick-walled parking lot, sits the 3,000-square-foot former storage building that Rabbi Zushe Cunin hopes will become the new site of Palisades Jewish Early Childhood Center. Rabbi Zushe Cunin, head of Chabad of Pacific Palisades for 16 years, is accustomed to “overcoming and embracing all challenges,” he said. But the uproar surrounding his plans to relocate Chabad’s Palisades Jewish Early Childhood Center to a vacant building off Los Liones Drive — in a canyon below an affluent Pacific Palisades neighborhood and off a service road leading to the Getty Villa — has surprised him. In support of the school’s nature-based curriculum, Cunin, 38, believed he had found an ideal new location when he came upon an empty 3,000-square-foot former storage facility at the base of a hillside property. He tracked down the owner, longtime Pacific Palisades resident Gene Gladden, who agreed to lease the property to Chabad. Cunin (photo) was making preparations to turn the site into a preschool, planning to open in September, when an attorney from the J. Paul Getty Trust sent a letter denying Chabad’s right to access the property via the Getty Villa’s service road. Around the same time, members of the neighboring Castellammare Mesa Home Owners Association, which has 141 member families, began a flurry of e-mails and telephone exchanges questioning Chabad’s right to access the property alternatively through Gladden’s backyard off Bellino Drive and also raising concerns about other safety and noise issues. Los Angeles City Councilman Bill Rosendahl has become involved, as has the Palisades Mormon Church, to which Cunin turned with a request for access through the church’s parking lot. This might seem just an ordinary land-use dispute with, on one side, a preschool hoping to operate in a residential area — which can be allowed with a conditional-use permit — and on the other objections from neighbors who don’t want increased noise and congestion. But there is a history of high-profile, contentious disputes in this neighborhood: The Getty weathered its own heated and drawn-out legal battle with local Pacific Palisades homeowner associations, which began in 1997 when it announced plans for an extensive renovation and expansion of the Getty Villa. The clash centered on plans for a outdoor amphitheater. The much-delayed opening of the Getty Villa didn’t happen until January 2006, following years of negotiation with neighborhood associations. Enter Chabad, an organization whose name is a Hebrew acronym meaning wisdom, understanding and knowledge, and which, as part of Chabad-Lubavitch is one of the largest sects of Orthodox Judaism worldwide. Known for its evangelical outreach and zeal, Chabad has its own history of controversy in many circles. Rabbi Cunin had been successfully operating Palisades Jewish Early Childhood Center in various locations in Temescal Gateway Park without conflict since the preschool was founded in 2000. The school enrolls approximately 50 children, ages 2 to 5, who, Cunin said, come primarily from Pacific Palisades and other Westside locations and from all levels of religious observance. Last year the Santa Monica Conservancy, which oversees the park, voted to end the lease of the Chabad preschool as well as that of the private Little Dolphins preschool, ruling that public park area should no longer be walled off for private endeavors. On Jan. 29, 2008, Cunin signed a three-year lease with a 20-year option on the building owned by Gladden, which sits near the service entrance to the Getty Villa, next door to the Mormon Church and across the road from Topanga State Park. Cunin began making some of the necessary renovations to the property. 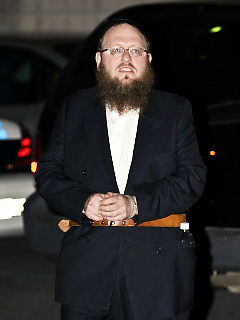 Everything went smoothly until April 2, when Getty Trust attorney Lori Fox informed Cunin that Chabad does not have the right to approach the building via a private Getty service road — which Chabad disputes. As a result, Cunin said, Chabad officials, teachers and workmen began accessing the property through Gladden’s driveway off Bellino Drive and down a steep stairway in Gladden’s backyard. Neighbors became aware of the activity, as well as of the building, which was newly painted inside and staged with small tables and chairs. An outdoor area now sported playground equipment to enable prospective parents and state inspectors to better visualize the future preschool. Cunin believes that many residents assumed, erroneously, the preschool was already open for business. Homeowners began an exchange of e-mails, and one homeowner, whose child had attended the school, contacted Cunin to clarify the school’s status. He assured her that he didn’t plan to use Gladden’s home as access for the school. She shared this information with the other neighbors. “It’s a building that’s safe and appropriate. It’s got a nice, flat garden around for the kids to play outdoors, and it’s got nice access: The parents can drive right up,” Reznik said. The Getty, however, sees the site differently. Getty attorney Fox sent a memorandum to area homeowner associations on May 9 summarizing the Getty’s communications with Chabad and objections to the location. “We have serious concerns about the proposed use of both the warehouse and access via our service road,” Fox stated in the memo, emphasizing safety concerns for the children. The dispute over use of the service road is not surprising, given its complicated history. Access along the service road to the Getty guard booth, which sits just above the driveway to the Gladden building, uses an easement granted by the Mormon Church, which bought its three-acre property in 1970 from a private developer, according to David Lacy, who founded Senior Realty Advisors of Covina, and who has assisted Chabad in property acquisitions for more than a decade. It was originally a dirt road, which the Getty paved and later widened, as required for its renovation. But Gladden was granted the necessary permits in 1981, he said, to construct a building on the lower part of his property for recreation and storage. He also received permission from the Getty to access the building via the service road. Gladden subsequently rented the building to the Getty for 25 years for storage purposes, a lease which ended approximately six months ago, according to Gladden. Because Gladden has been allowed access to his building for the last 26 years and because the Getty has never revoked that right, Lacy believes that Gladden as well as Chabad, as his representatives, “has a legal right to a prescriptive easement” on that property. However, a survey that the Getty conducted in 1999 as part of its expansion marks the boundary 13 feet inside what Gladden assumed was the property line, putting the building — three feet along the building’s entire length, on the side paralleling the service road — on Getty property. Still, whatever the case, the issue is resolvable, according to Reznik. “That building is a moveable, mobile building. What’s the big deal?” he said. Ideally, Cunin said, he would like to access the building through the parking lot of the Mormon Church, which is next door and which would entail merely creating a small gate in the already existing fence. Cunin’s request, however, was turned down by church officials in Salt Lake City in an e-mail sent May 27, according to Keith Atkinson, West Coast spokesperson for the Church of Jesus Christ of Latter-day Saints. “It is not our practice to encumber our property to enable our neighbors to obtain conditional-use permits. It puts our property at a certain liability. It doesn’t serve our members well and doesn’t serve the neighbors well,” Atkinson said. And while stating that the Mormon Church prized its relationship with the Jewish community, Atkinson cited “a multiplicity of sensitivities” in the neighborhood. Cunin is appealing to “higher levels” within the church. He is also hopeful that Chabad can create a partnership with the Getty. At the same time, Cunin has given assurances that students will not enter through Gladden’s property on Bellino Drive. “That never was our intention,” he said. Still, Chabad staff, parents and workers have used it, and will continue to use it, until the Los Liones Drive entrance is secured, according to Cunin. Kim Clary, president of the Castellammare Mesa Home Owners Association, said that neighbors are “greatly relieved” that access will not be through Bellino Drive. Still, the homeowners are concerned about increased noise, which Clary describes as “like a megaphone coming up” for neighbors who live on the ridge above Gladden’s building. The residents say they are also worried about increased traffic, especially at the already dangerously congested intersection of Sunset Boulevard and Los Liones Drive, where the Westside Waldorf School, which relocated to the south side of Sunset Boulevard in fall 2006, agreed to erect a traffic light. “We don’t really want a school in this neighborhood at all. We’re worried about the safety of the kids,” Clary said. Area City Councilman Rosendahl has met with Cunin. He has also met with community members, assuring them that he sent a group of building inspectors to the location and that thus far Cunin has not required permits for any work that has been done. He also said that Cunin has assured him that he intends — and has always intended — to go through proper licensing and permitting processes. “This is basically a school looking for a home,” Rosendahl said, making clear that he is not taking a position. He said he sees his role as that of an “honest broker,” ensuring that all parties feel empowered and heard as Chabad proceeds along what Rosendahl calls “the public, open and transparent process” of seeking a conditional-use permit. Meanwhile, Palisades Jewish Early Childhood Center will hold its final day at the Temescal Gateway Park location on June 19. The six-week summer session, beginning July 1, is slated to take place, as it has every summer, at Palisades Elementary School. Chabad remains open for enrollment. If necessary, Cunin said, he will find a temporary site to begin the fall session on Sept. 4, but he is hoping to have the permit process completed in time to use the new facility. Gladden, the non-Jewish property owner, told Cunin that when the Getty’s lease ended, he had been looking to use his building for a spiritual purpose. “I told God, whoever needs it will come knocking,” Gladden told Cunin the day that Cunin actually came knocking on his door, trying to find the building’s owner. Zoning laws do not apply to the Lubavitch. They are entitled and if they do not get their way they litigate and forever. They cause these problems all over the US. I think they take a course in their schools on how to screw the neighborhood and not follow the zoning laws. Wait till they cry anti-semitism…that comes next. IN mid-April, a young black man in Crown Heights was struck with a baton and sprayed with Mace by two white men, according to the police, and ever since, tensions have run high in the Brooklyn neighborhood. Jews and blacks who live there eye one another warily, and police patrols and surveillance have intensified. Yossi Stern of Shmira, a Jewish citizen patrol group whose competition is another patrol group. But there is another split on these streets, not between Jews and blacks but between Jews and Jews. The feuders, paradoxically, are neighborhood patrol groups that officially aspire to keep the peace. Jewish patrols exist in several New York neighborhoods, like Brooklyn’s Borough Park, but Crown Heights is the only area that has two such competing patrols. Their names, Shomrim and Shmira, both derive from the Hebrew word meaning “guard,” but the two groups fiercely resent each other nonetheless. Yossi Stern, the director of Shmira, denied these accusations, saying, in effect, that Mr. Hershkop was a sore loser with a weakening organization. Shmira and Shomrim were once a single group, but they split apart roughly a decade ago and, predictably, disagree over the reasons why. They also display a sibling-like rivalry. 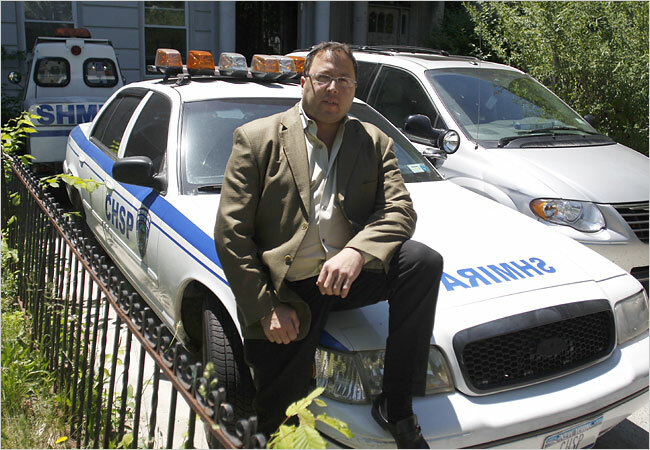 Mr. Hershkop said that he put a patrol car on the street in 2006, complete with flashing roof lights and the Shomrim logo, but pulled it off a month later when Shmira introduced its own car. Tensions have been stoked by an anonymous blog called “Who Is Shmira?” featuring posts and comments that are virulently anti-Shmira and strongly favorable to Shomrim. Mr. Hikind said he had been urging the two groups to reunite. “There is no reason in the world why there should be two groups of people involved in patrols,” he said. Mr. Stern has denied any link between Shmira and the attack. A bar mitzvah tutor from the Flatbush section of Brooklyn is facing charges that he sexually abused four boys, the Brooklyn district attorney, Charles Hynes, said yesterday in a statement. The tutor, Yona Weinberg, 29, was initially arrested two weeks ago. Some, but not all, of the boys Mr. Weinberg is alleged to have abused were his students, Mr. Hynes said.